Staying informed, staying healthy, staying independent as you age ain’t easy! And the complexity of local, state and federal programs designed to help don’t always make it any easier! 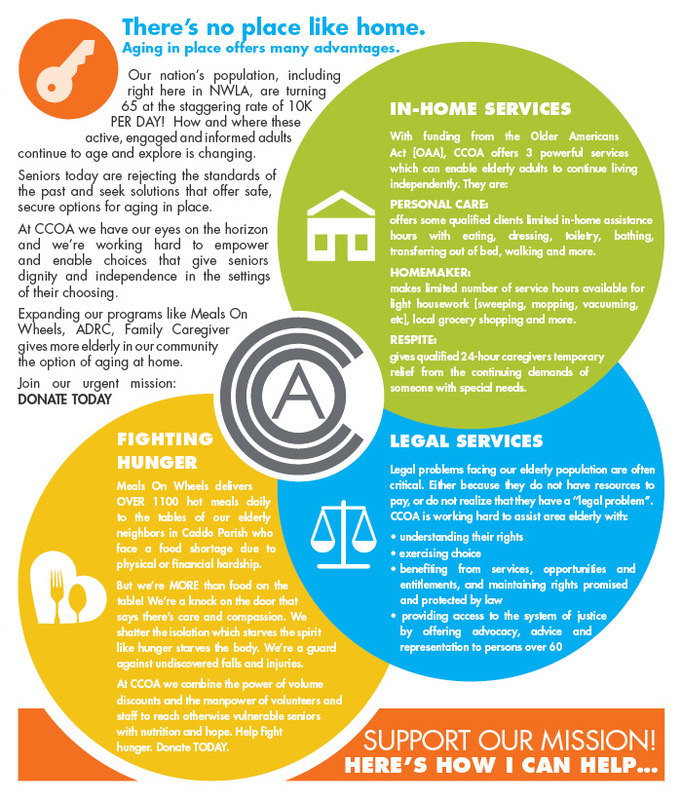 Fortunately, CCOA is focused on advancing the cause of the elderly in our community, serving their needs and supporting their caregivers. We offer highly trained and caring counselors that are up-to-the-minute on services and resources. It's good to have someone that's always on your side! 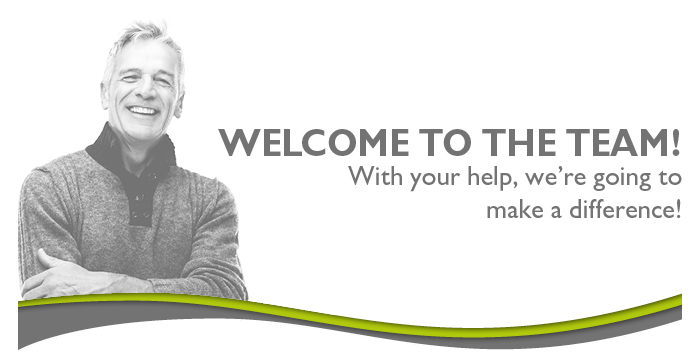 We ask that you take a closer look at the valuable services; the expertise of our helpful staff, and, if your situation permits, please consider supporting one or all of our programs like: Meals On Wheels, Ombudsman, Caregiver Respite, ADRC and others. Give a little, or, give a lot: EVERY PENNY COUNTS! We will work hard to stretch your donation dollars by keeping overhead costs low and leveraging the power of volume discounts to reach more of the seniors, right here at home, who are in need. 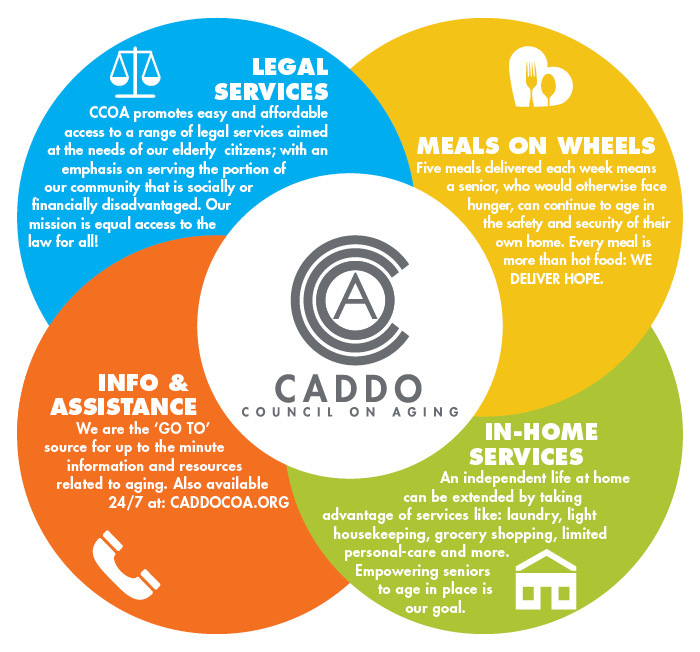 Caddo Council On Aging [CCOA] is critically important to people of all ages, of all social and economic means and all levels of ability to find and secure the services they need. CCOA offers a “single point of entry” for clients and families to get their questions answered in one place by experts. But what's really unique about your CCOA is we're available to speak with you FACE TO FACE. In an age of 'auto-response' and recorded menus, we offer an expert staff you can sit across a desk from, Monday - Friday, 52 weeks a year! 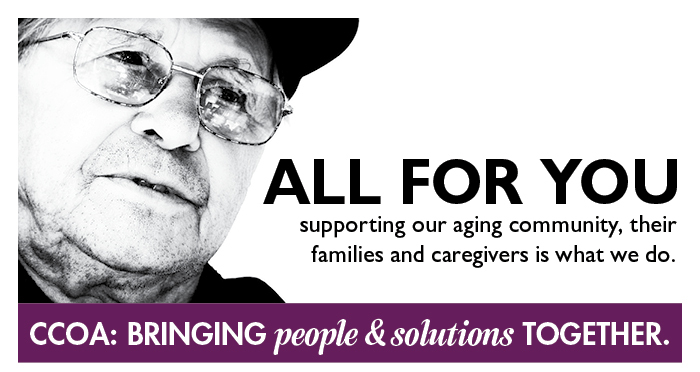 We ask that you take a closer look at the valuable services; the expertise of our helpful staff, and, if your situation permits, please consider supporting one or all of our programs like: Meals On Wheels, In-Home Services, Family Caregivers, ADRC and others. Give a little, or, give a lot: EVERY PENNY COUNTS! We will work hard to stretch your donation dollars by keeping overhead costs low and leveraging the power of volume discounts to reach more of the seniors, right here at home, who are in need. Every Thursday: MAKE A CONNECTION! Join your neighbors over 60 in the heart of Shreveport’s historic Fairfield District [map] for a wide variety of presentations, programs, exhibits, workshops and more! Every Thursday: LIVE! And LEARN! The future of Advanced Age is amazing. There have never been so many opportunities, options, choices and chances for people over 60. But, HOW to make sense of it all, WHERE to turn for reliable information? 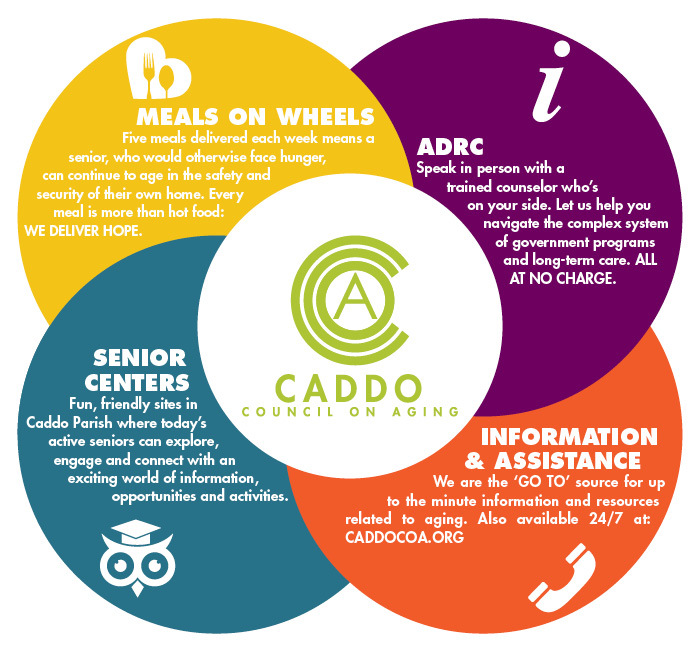 Caddo Council On Aging is your ‘one-stop’ source for all age related info! 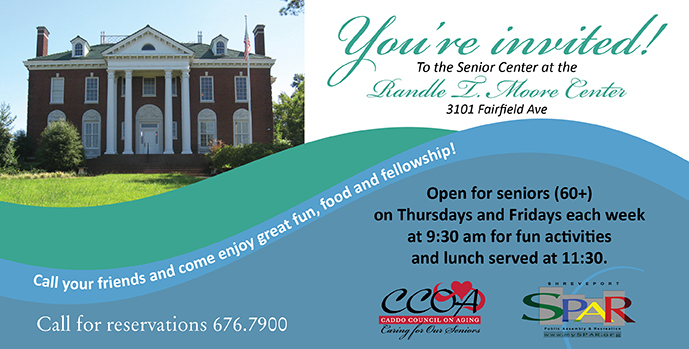 And the Randle T Moore Center is right next door! Every Thursday: TELL A FRIEND! If you, or someone you know, is looking for the Activity Center of the future; LOOK NO FURTHER! Connect with a growing family of active, involved seniors eager to learn and grow. JOIN US EVERY THURSDAY. Every FRIDAY: It’s TechTalk: You spoke! We listened! Now you have a place to learn about computers, laptops, smart phones, internet and Social Media that’s FREE! We only cover the basics and there’s even 1on1 time for every pupil. Can’t teach an old dog new tricks? Nonsense! Some of our best tutors are over 60 themselves, and know firsthand the challenge of adapting to new technology. Who knows! You may even become a tutor in time! The internet is a powerful resource and offers a world of information. Let YOUR voice be heard and learn what others have to share with you! CLICK HERE to read a recent Shreveport Times article. CLICK HERE, to visit our Tech-Talk page. Delivering OVER 1000 meals a day! The generous support of donors, area businesses, churches and service organizations has helped CCOA and our Meals On Wheels program fight hunger for more seniors than at any time in our history. We are working hard to stretch every dollar of large and small contributions as well as keeping overhead costs low! As of June 1st, 2013 we have the smallest waiting-list in 3 years! The need in our community is growing, but TOGETHER we are making a difference in the lives of seniors at risk of hunger! If you have recently contributed to our urgent mission, please accept our sincere'THANKS!' If it's been a while and you'd like to help us bring hope and a hot meal to the door of your Caddo Parish neighbors, it's EASY & SAFE! Your TIME is more precious than gold! 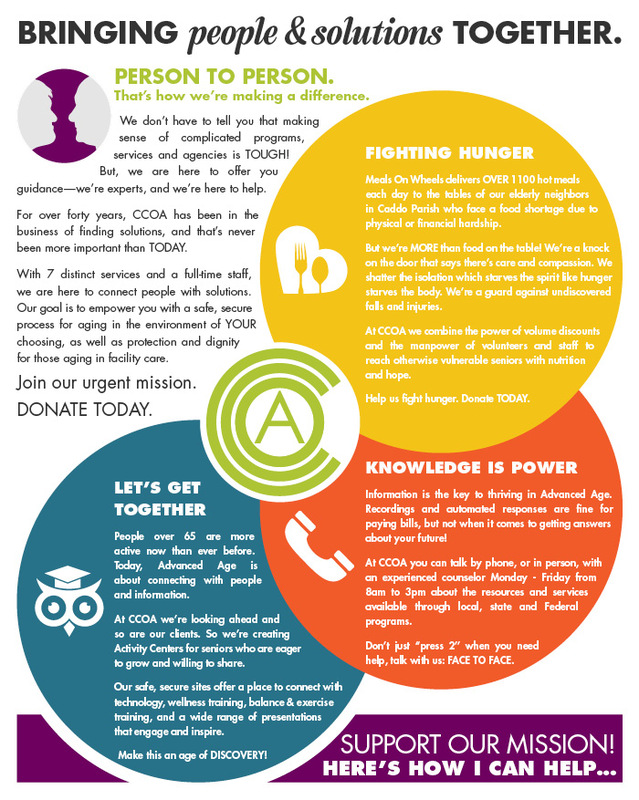 Did you know: Volunteer meal-delivery drivers represent an $84,558.00 ASSET on the CCOA balance sheet?! Do you have 1 hour, 1 day a week? If so, contact us [email or M-F @ (318) 676-7900] and find out how easy it is to be part of our mission to turn back the tide of elder hunger. After a short orientation you can start bringing hope and good nutrition to the door of a neighbor at risk of hunger. Circulating air helps perspiration cool the body & lower body temperature. Learn more HERE. YOU CAN HELP: DROP-OFF or DONATE TODAY! 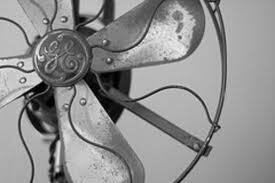 DROP-OFF: Media partner, KSLA News 12, will accept any BOXED electric fan at their studio located at: 1812 Fairfield Av during regular office hours Mon - Fri until Sept 1st. 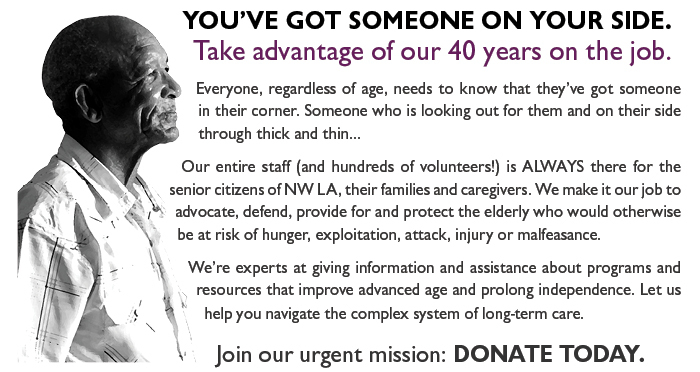 DONATE: Your $10, $20, $40 (or more) donation allows CCOA, together with retail partner Lowe's, to buy direct at a discounted rate long lasting box fans which we distribute directly to the homes of NWLA seniors over 60 who struggle to maintain independence in their own home. Medicare Original and Medicare Advantage are complex programs. Having a thorough understanding of your rights, coverage, premiums, deductibles, exclusions, exceptions, etc. is a formidable challenge. 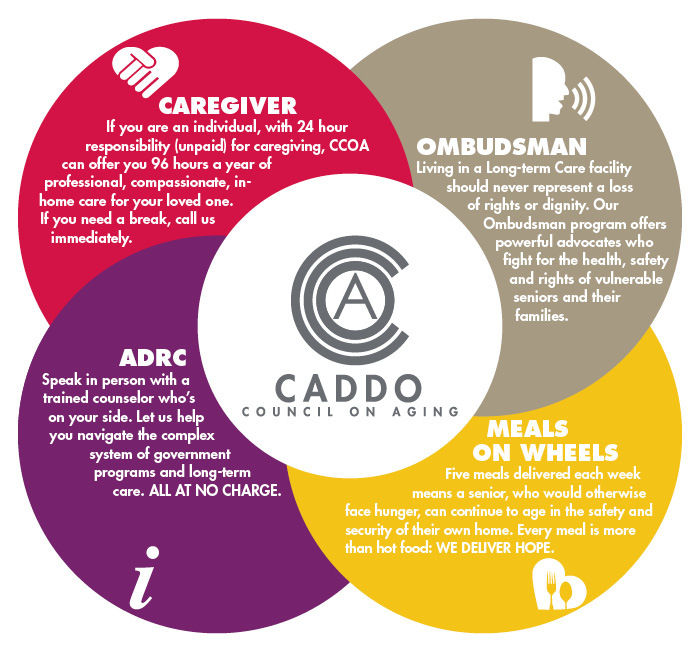 Caddo Council On Aging [CCOA] and our Aging & Disability Resource Center [ADRC] offer you FACE TO FACE access to a Benefits Counselor. A friendly, expert who has extensive training, many years of experience and maintains up-to-the-minute updates on every aspect of public and private health insurance coverage. Open Enrollment is your ONE CHANCE to precisely match your own health insurance needs to the best coverage for the coming year. Make certain you have taken advantage of ALL the valuable resources we offer at CCOA through our ADRC program. ALL AT NO COST! We can help. Just ask! Contact us TODAY and make an appointment to talk in person with one of our experts. Original Medicare and Medicare Advantage plans are two different ways that someone with Medicare can get health care coverage. When you first enroll into Medicare, you start off with Original Medicare. Thereafter, you can choose to keep Original Medicare, which is when you get health insurance through the government, or you can sign up for a Medicare Advantage plan, which is when you get Medicare coverage through a private insurance company. During Fall Open Enrollment (October 15-December 7), you may make changes to your health care coverage if you have Medicare. One of the changes you can make during this time is switching from Original Medicare to a Medicare Advantage plan and vice versa. You can make as many changes as you like, and the last change you make will take effect on January 1, 2013. Keep in mind that it’s important to think about your health care needs when making choices about your health care coverage. The traditional fee-for-service Medicare coverage you get through the federal government. Original Medicare consists of Part A (hospital insurance) and Part B (medical insurance). Most people who have Original Medicare need to sign up for a stand-alone Part D plan (prescription drug coverage). If you have Original Medicare, you should use the Original Medicare red-white-and-blue card whenever you go to the doctor’s office or a hospital. These plans offer Medicare benefits and are sold by private insurance companies. Most Medicare Advantage plans include health and drug coverage. These plans must offer at least the same benefits as Original Medicare, but each plan has different costs and restrictions. If you have a Medicare Advantage plan, you should use the card your plan gives you, whenever you go to the doctor’s office or a hospital. You cannot have both Original Medicare and a Medicare Advantage plan. You must choose how you want to receive your Medicare health care benefits. Click here for a chart that shows the main differences between Original Medicare & Medicare Advantage. Understanding Medicare means understanding the meaning of many unfamiliar terms. For your convenience, below is a link to a list of definitions of words and acronyms that are frequently used in Medicare, or are important to give you a better understanding of how Medicare works. The internet is brimming with valuable information that can (and does) change lives. The challenge is to cut throught the noise and get straight to the facts relevant to your needs. 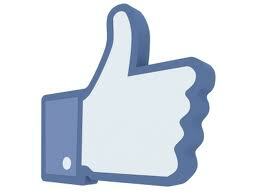 The team at CCOA scours the web to find resources and referrals related to the future of Advanced Age. Facebook is a dynamic and powerful platform that allows the experts at CCOA to keep you up to the minute on developments and advances important to the caregiver, the volunteer, the advocate, the loved one of anyone who is aging. How can I find if I'm getting a rebate on my health-insurance premium? If you're already a Fan, TELL A FRIEND! June got started with a BANG! The wonderful folks at Libby Glass threw in 100 fans to get us started. We have been overwhelmed by the outpouring of compassion from our neighbors, area businesses and organizations. Occurs when the body loses its ability to sweat, and it is unable to cool down. Body temperatures rise to 106°F or higher within 10 to 15 minutes. Heat stroke can cause death or permanent disability if emergency treatment is not provided. Each day brings more news of reduced local, state and Federal subsidies aimed at fighting hunger in our elderly communities. At the same time, the population of Caddo citizens over 60 who face a shortage of food grows at an alarming rate. These conflicting forces mean that to maintain (and even grow!) the number of plates delivered per day, we must seek supplemental revenue from the community. The generosity from our community has been overwhelming! Remember: It's not whether you give a little, or give a lot. That's a 4% increase from 2011. Our management team at CCOA works hard every day to leverage our bulk buying powers to stretch every dollar. We fight to keep overhead and expenses low. We're proud that 91¢ of every donation dollar goes directly into delivering a hot meal. That's an 11% increase from 2011. This increase lowers the Waiting List to its lowest in 2 years. "One time" funding sources will have to be replaced to continue this level of service. JOIN OUR URGENT CAUSE: DONATE NOW! There are changes to coverage/premiums/deductables. GET THE FACTS! Either you or your spouse must have worked in Medicare-covered employment for at least 10 years. 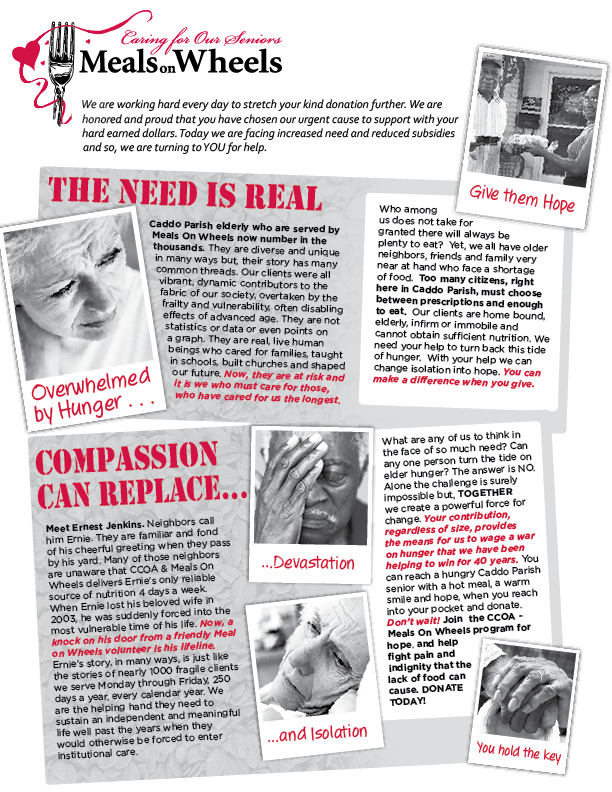 Below, you'll find an 'E' version of a recent letter we mailed to thousands of our kind donors/supporters which describes the enormous challenges our Meals On Wheels program faces. We ask that if you are able to contribute any amout, large or small, that you take advantage of our PayPal service and help us deliver hope to our neighbors over 60 who face a nutrition shortage. Or, simply forward this urgent appeal to friends & family in your contact list. HOW: Come and join the parade! CLICK HERE to schedule your appointment, or learn more! "...you want to help yourself? Help someone else, get one-on-one with real people." Away in the distance, Shreveport native Merrilee Leatherman noticed the 'Golden Years' quietly approaching. As an active member of her church, a busy freelance writer and community volunteer Merrilee wondered; "What's next?" "Needed: Volunteer drivers for St Vincent de Paul Society Meals On Wheels routes"
It wasn't long at all till Merrilee was active in getting the St Vincent routes set up and delivering TWICE a week to grateful folks in Highland never dreaming how much she would get back from the endeavor! "I'm the one who benefits." insists Merrilee. "The gratitude, the warmth... These folks are like family to me." That was four years, hundreds of miles, hundreds of door knocks, hundreds of hugs and hundreds of meals ago and you still couldn't find a bigger advocate for the CCOA and Meals On Wheels mission! "... another plus is the leadership team at Caddo Council. I have always felt strongly that my time and money were in the hands of good stewards and doing great good in my community." 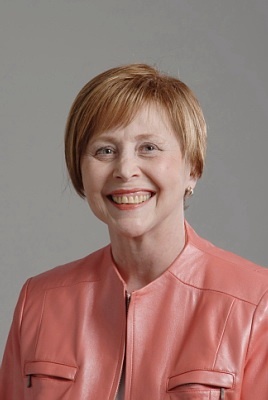 Merrilee also shared with me: "... on any special occasion, my friends all know what to do. Make a donation to Meals On Wheels in my honor. I have all the 'stuff' I'm ever going to need. Let your kindness do some good for a person in need." All of us at CCOA, on behalf of the lives that are touched by tireless volunteers like Merrilee want to say: THANK YOU! There are countless stories of volunteers like this one out there. PLEASE SHARE your stories with us so we may inspire and enlist the next generation of generosity. 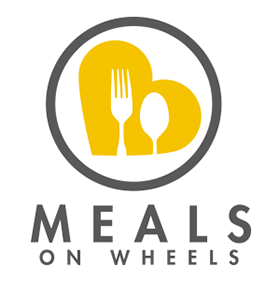 ASK at work, church or school if there's a Meals On Wheels delivery program. No? We can help you start one! WHO: Every citizen celebrating 100 birthdays OR MORE! WHAT: Ceremony and events to honor this extraordinary accomplishment! ENLIST every citizen in the urgency of our cause. ADVANCE the volunteer's desire to serve. 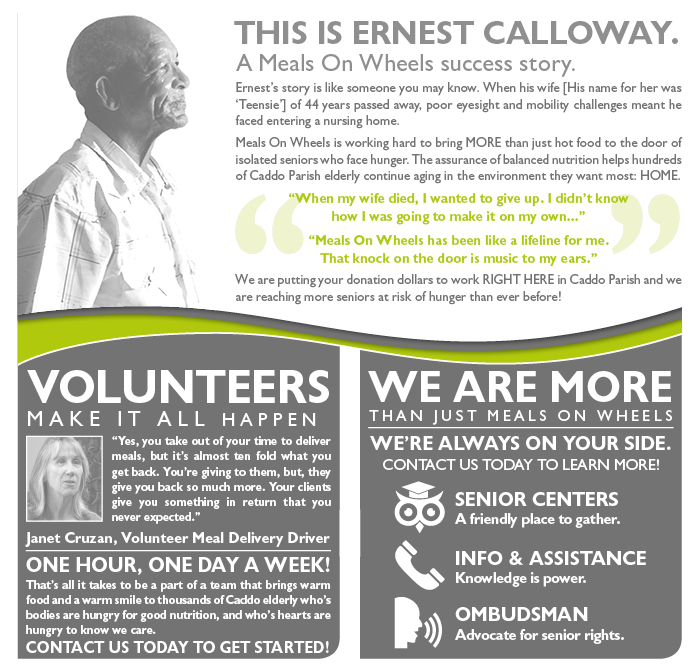 Meals On Wheels delivers over 5000 meals each week to Caddo Parish seniors at risk of malnutrition. 300 volunteers, cover 852 sq. miles in Caddo Parish to deliver a hot, balanced meal, life-sustaining social contact, and valuable safety-net to isolated recipients. 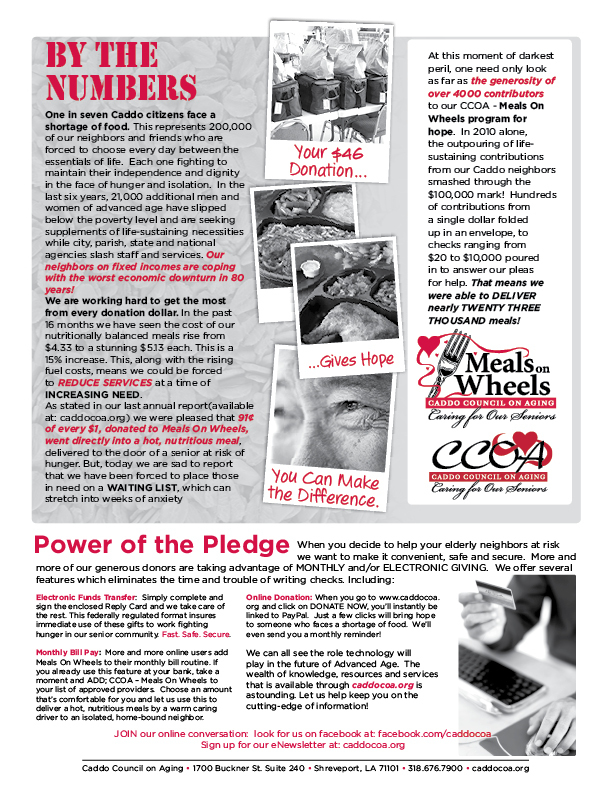 Twice a year (March & November) Caddo Council launches a Fundraising Campaign to benefit Meals On Wheels. Home meal delivery empowers a senior to stay in their homes longer, maintaining independence and dignity. The warmth and gratitude of our clients strengthen and inspire the volunteers who give so generously of their time and energy. NINETY ONE CENTS of every Meals On Wheels donation dollar goes directly to putting hot food on the table of a senior citizen at risk of hunger! Caddo Council works hard every day to reduce overhead expenses. This eNewsletter is one more example of that commitment. 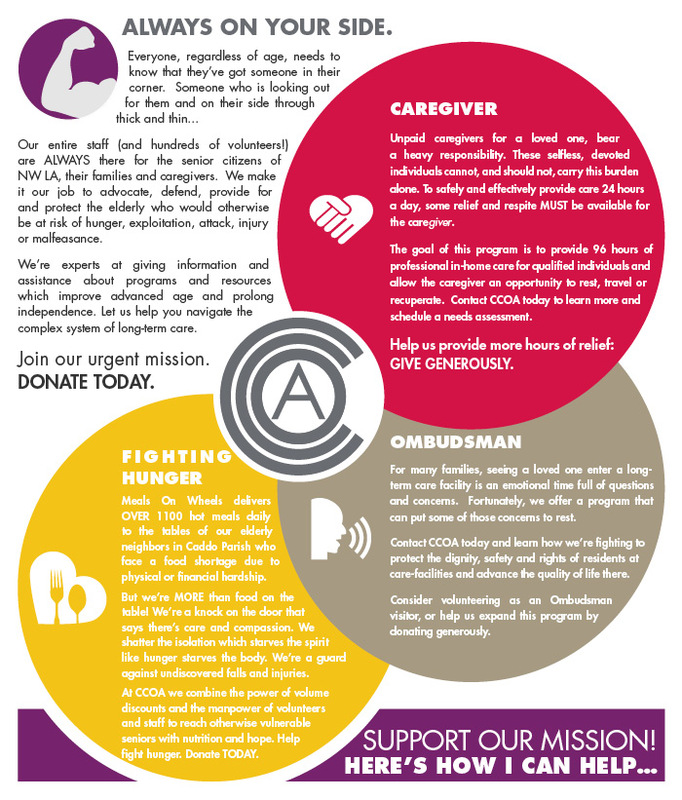 We'd be so grateful if you forward it to other potential donors and volunteers. Research shows we have less than 60 seconds to "close the deal" and inspire a donor to join this worthy cause. 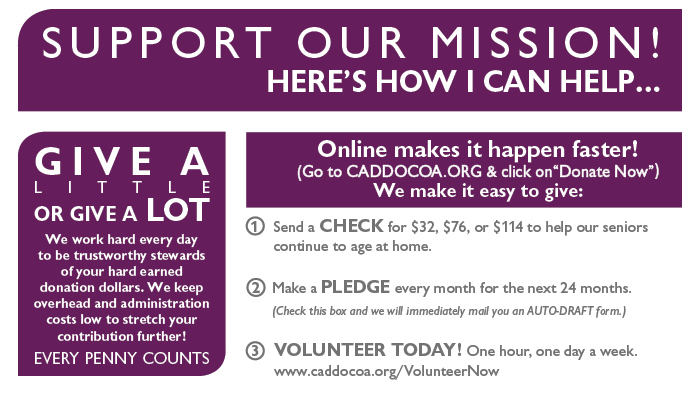 CLICK HERE NOW and donate online to Caddo Council's fight to turn back the tide of elder hunger. Meals On Wheels: Be part of the cure. Drivers pick up meals at a central location then follow a specific route to deliver to recipients. All Meals On Wheels programs have events and fundraisers that require extra help - including planning and organizing, publicity, onsite setup and staffing and much more. Contact us to learn more about upcoming events. Meals On Wheels programs have an administrative side. Volunteers provide administrative and clerical support to keep the office running smoothly. Volunteers assist in organization, packing "hot-boxes" and vehicles for delivery. Volunteers make regular phone calls to the seniors to check up on them. This is often a great opportunity for volunteers looking to participate from their own homes on a flexible schedule. Meals On Wheels provides congregate meals in addition to home delivered meals (serving meals at a central location) where seniors can come to eat together. Opportunities are available for those interested in helping with activities, meal service and other tasks. CLICK HERE to volunteer, or learn more! You've gained a lifetime of experience. Now put your skills and talents to good use by volunteering through RSVP. RSVP is America's largest volunteer network for people age 55 and over. Join RSVP and you join nearly 500,000 volunteers across the country tackling tough issues in their communities. RSVP offers a full range of volunteer opportunities with thousands of local and national organizations. With RSVP, you choose how and where you want to serve. You choose the amount of time you want to give. And you choose whether you want to draw on your skills or develop new ones. Find the opportunity that's right for you. Volunteering leads to new discoveries and new friends. Foster Grandparents: Share today. Shape tomorrow. When you share your love, time, and experience, you have the power to help a child who needs you. If you're 55 or older and want to share your experience and compassion, you have what it takes to be a Foster Grandparent. As a Foster Grandparent, you're a role model, a mentor, and a friend. You help children learn to read, provide one-on-one tutoring, and guide children at a critical time in their lives. You give the kind of comfort and love that sets a child on the path toward a successful future. Foster Grandparents can serve up to 40 hours per week. Some volunteers may qualify to earn a tax-free, hourly stipend. With Foster Grandparents, you'll receive pre-service orientation, training and supplemental accident and liability insurance while on duty. When you volunteer, you're not just helping others - You're helping yourself. Caddo Courthouse Sq. (Texas St side) down Market St to Shv.Ent.Dist.